There is still time to become a part of this event! Upon registration we will rush you the download link for the first sessions as well as the book to get you up to speed! Good content. By its nature it covers a lot of information which makes it a bit hard to retain important points. This presentation was very well structured, the hypothetical example helped get into perspective the context of the message. Exponents organized very well their time and exposition content, sending a clear message. So far this has been the best webinar ... and the webinar pace allowed for all the handout material to be addressed - Good Job! 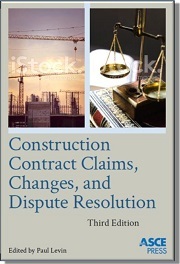 A free hard-cover copy of the new 2016 Construction Contract Claims, Changes & Dispute Resolution - 3rd Edition to be published by ASCE Press is included with the registration. Each chapter is authored by one or more construction experts and/or attorneys; these very same authors are presenting their respective chapters of the webinar series. Successful construction claims and change-order management is 25% legal, 25% contractual, 25% factual and 25% the personal knowledge and experience of the parties. The Essential Course on Successful Management of Claims and Changes Orders puts you on the path to balancing the many balls required to avoid costly claims, achieve appropriate recovery for changes and delays, and to enjoy successful projects. Construction claims and changes are an inevitable process on a construction project, particularly public construction, infrastructure, heavy, healthcare, energy, transportation, civil and industrial projects. Both owners and contractors are still getting into knots in their approach to managing and controlling claims. Conflicting interests, schedule and budget constraints, the urgency of dealing with day-to-day issues and the varying levels of experience of the project staff leave open many opportunities for adversarial relationships of the contracting parties. Sign up your staff for this comprehensive event to avoid costly mistakes, raise expertise and help them learn new ways to avoid and manage claims. Each session is presented by one or more industry experts with decades of construction claims experience. The course schedule includes two sessions a month September, 2017 through March, 2018 with each session beginning at 1:00 PM Eastern and running for 90 minutes. Attendees will receive reminders a few days before each session as well as PDFs of the presentations, so conference room trainings can be comfortably arranged in advance. For one low price, train your whole staff in these interactive sessions, including a 15-minute Q&A period where you can ask your questions live. Save travel and hotel expenses and lost work time. All sessions are recorded and available for download at your convenience, so no need to worry if you miss a class here and there.